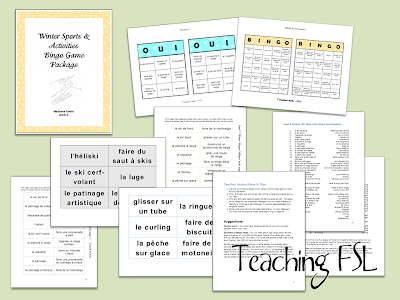 I recently had a request to blog more about a variety of games for the French as a second language classroom. If you're pretty familiar with my blog & the types of activities I like to do, then these first few options will probably be nothing new to you. I do however have a little treasure that I haven't shared outside of my classroom since "the days of yore" (aka Teachers' College! ), so stick around! I thought and thought, then planned and planned... several days and do-overs later, the Winter Sports & Activities Bingo was born. So, essentially, I only want to keep spending hours on them if people like them and can find a use for them. If you have a themed bingo game request, with enough notice for me to spend time developing something, please do let me know! My current students are huge fans of this oral chain game. It doesn't take much time, and they always ask to play multiple times. 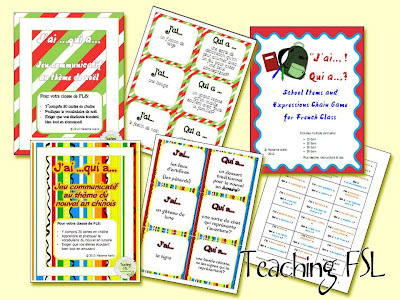 In a Core French or beginner class, it would definitely require a little pre-teaching. I've got a couple that deal with holiday events (Christmas, Chinese New Year), and plan to bundle them up when I get a couple more completed, to offer at a reduced price. There are ... ahem... a couple in my files that I didn't quite get done in time for the holiday upon which they are based. I also have some that are more appropriate for core French, including the fact that they take a lot less ink and paper when printing (as I've found that the pieces seem to disappear a lot more easily in those classes). My former students enjoyed this activity too. This is one of my best selling items on TPT (and TN). I probably was inspired by something I saw somewhere else (aside from the Hasbro (TM) game itself!, which I've credited in the product) since I found cards with Qui, Où and other interrogative words in my file boxes from when I first started teaching... literally in a previous millennium ... but honestly I couldn't figure out how I had used it back then so I sat down and remade one from scratch. I ended up creating multiple versions for scaffolding and differentiation. I figured even if you don't use them all in one year, at some point you'll get a group that's a lot higher or lower than usual, and it's always good to have something tucked away for when that happens. This is my old standby! 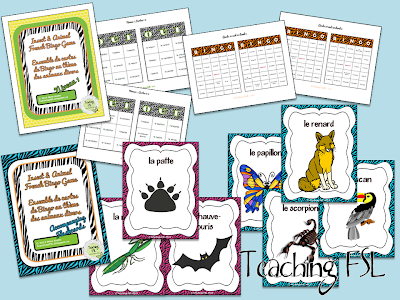 It's one of a few games that I came up with before becoming a teacher, when I was getting volunteer experience in a French classroom after I completed my B.A. degree, before I even applied to teachers' college. A confession on Easter Monday... I usually don't even use my own sheet for this - just a blackboard or a classroom whiteboard is all you need! It's a great game to play as a sponge activity. Once the kids understand the rules, they really enjoy it, and I find that even those who are more reluctant to participate (i.e. weaker students within a Core French class) are eager to offer at least one answer. Either way, the game comes with a printable PDF version, an editable Word version, and full instructions (en français!) for play. I'm offering it free for the first 6 hours after this blog post, and then it will be available for $1 as a nice little activity to top up another TPT order. Thank you for sharing your hard work! 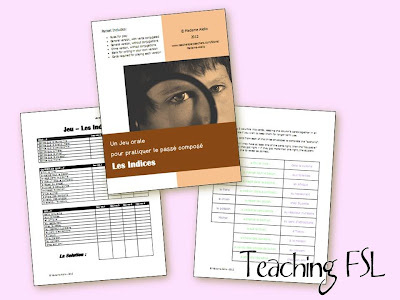 I only had French lessons in high school; but, these lessons & activities really will be a great help to those teaching it now! Great list of educational games. Almost all young children enjoy the challenge of participating in games, and the process of enjoying a number of academic routines may actually make sure they are smarter and more capable.